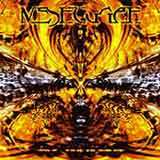 If you like technical music, music calculated to the note, music that takes three years of advanced calculus to decipher for that masturbatory exuberance, look no further than Meshuggah. While I am not usually partial to what Ben calls “Progressive Wankering,” I do enjoy this mechanical metal from Sweden once again. Meshuggah has been around since 1989 and recently rose to great renown after being featured on The Osbournes and headlining the second stage at Ozzfest. I recently saw them for the first time at the New England Metalfest and they did impress. Since we’ve gotten requests for this band, here is us delivering. The guitar sound is striking in that it’s very low. The low end compliments the bass and the drums very well. The album was played on 8-string guitars and honestly I can’t hear the difference aside from the low end. The drumming is amazing. To be able to keep the beat with all the constant time changes and patterns is an awesome exercise. The vocals are your standard death metal vocals. Nothing too special but definitely on par with other bands in the scene. “Closed Eye Visuals” is probably my favorite song. From the melodic, jazzy solo to the lingering chords of the break down, it is a treat from beginning to end. I especially like these chords playing a background to the grinding machine of music that is playing on top of it. Some complain that Meshuggah is repetitive and this complaint is founded to some extent. After five minutes, you occasionally get bored of the same showmanship over and over again. This also makes the songs difficult to differentiate. If they hadn’t announced the song titles before each song, I might not have known which songs they were. “Rational Gaze” is also on the list of killing songs. The riffing combined with the constant splashing of the cymbals is an interesting effect. I have always liked the splash cymbal and it is used in a new and creative way here. The lead part’s melody is similar to some “Rust in Peace” era Megadeth that has been distorted and returned from hell. These guys are the masters of sound manipulation and it’s incredible that they can reproduce all these wacky noises live. “Spasm” is one of the faster tracks and has a background that sounds similar to the tubular bells. It’s a nice effect and I appreciate the effort. To reiterate, the album does suffer from a monotony syndrome and this song is no exception. “Nebulous” is one of the more slow and plodding tracks. The vocals are the star here, being sung death screams which is interesting to try to take in. The only track that I really didn’t like was the closer “Obsidian.” It’s just four and a half minutes of chords, distortion and notes ringing into infinity. I could have done without this song. If it was an experiment, the experiment failed. Meshuggah can hang with the best of the best when it comes to technicality. However, complexity does not make a song on its own. With a little more variation a la “Chaosphere” or “Destroy Erase Improve” this album would have been a contender for album of last year.